MUNICH — Eleven years ago the late Marcello Viotti quit as chief conductor of the Münchner Rundfunk-Orchester because he foresaw existential cuts in its budget. Happily the MRO survived, and today thrives. Tasked with exploring rare repertory, it is artistically the livelier of BR’s two orchestras, forcibly more daring than the Bavarian Radio Symphony Orchestra and free not to endlessly regurgitate Bruckner and Mahler. Its CD output offers a peek: Des Simplicius Simplicissimus Jugend, Trouble in Tahiti, Braunfels’ Verkündigung, Pärt’s Te Deum. Much credit belongs with current Künstlerischer Leiter Ulf Schirmer, who has fostered a rich string sound. But another MRO dimension is the Paradisi gloria concert series, a legacy of Viotti that leavens each season much as Alexander Pereira’s Ouverture spirituelle brightens the Salzburg Festival. 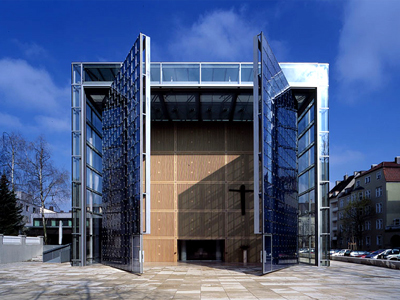 That string sound and the spiritual programming overlapped poignantly last Friday (Nov. 13) in a sold-out concert at the Herz-Jesu-Kirche, a chic shoebox of a venue in glass and louvered wood near Schloss Nymphenburg. 25-year-old Lorenzo Viotti, winner of the latest Salzburg Festival Young Conductors Award, manned his father’s onetime podium for Poulenc’s Sept répons des ténèbres framed by grief-laden essays of Messiaen, Les offrandes oubliées and Le tombeau resplendissant. The essays comprise baldly contrasted panels, with slow material that extends unrestrainedly. Both were written before the Avignon-born organist turned 23 and in the wake of the loss of his mother. Offrandes (1930), a triptych, centers on a wall-thumping tantrum titled “The Sin” for full orchestra; its serene, rather bland outer panels are in the strings alone. Tombeau (1931) more astutely channels the composer’s anger and acceptance in four sections, vif-lent-vif-lent, which Viotti and the MRO traced with riveting precision. The nature of Poulenc’s suite, a personal Passion piece, brought to mind the elder Viotti’s untimely death ten years ago, at age 50, not long after that anxious resignation. There was an elegance to his conducting, a rhythmic subtlety and rare degree of insight in lighter-limbed scores. Qualities much missed. Sept répons des ténèbres (1961) sets texts chanted during the Holy Triduum, specifically in prayerful vigilance as candles burn out, to signal the extinguishing of Jesus’ life. The verse-and-respond form serves only as a basis for Poulenc, who boldly and equally deploys chorus and orchestra, and with chiseled calculation. By turns nostalgic, biting or sour, his ideas concisely distinguish each répons and leave intense flavor. Only the relatively long last piece permits contemplation: Ecce quomodo moritur justus (See How the Just Man Dies), spun out wistfully over a rhythmic ostinato. Simona Brüninghaus’s shaky but boyish soprano projected the innocence in the limited solo part (intended by Poulenc for treble voice, possibly a projection of himself). Although not always clear in its Latin, the BR Chor navigated the often sharp contours with expertise and, for Judas mercator pessimus (Judas, the Worst Merchant), a certain brutality. Viotti mustered grandeur in Tenebrae factae sunt (There Was Darkness) and due gravity for the brass-tinged Sepulto Domino (The Lord Having Been Buried) despite mishaps in the MRO’s winds. Throughout, the conductor kept balances in check and conveyed confidence in the music’s ability to explain itself — a resignation of a different kind. This entry was posted on Thursday, November 19th, 2015 at 5:05 pm	and is filed under Munich Times. You can follow any responses to this entry through the RSS 2.0 feed. Both comments and pings are currently closed.